At the beginning of October, we had the opportunity to visit one of the most interesting and probably unknown regions of southern Spain. The Natural Park of Sierras de Tejeda, Almijara and Alhama spread between the provinces of Malaga and Granada. Established as such since 1999, this protected area of more than forty thousand hectares is crowned by Tejeda’s peak of 2,065 meters of altitude. The 360 does not leave anyone indifferent, find beautiful views of the Mediterranean while watching the nearby Sierra de Loja, Cabra Montes and of course, Sierra Nevada, is unique. We chose as a base the village of Jatar, in the Granadina area. 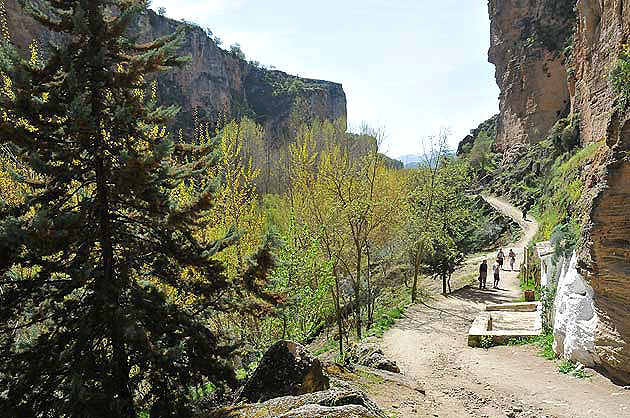 Its location allowed us to discover other routes (Pico del Lucero), as well as the Bermejales swamp, to visit the river Alhama and its rocks in the stone, to enjoy the thermal baths in that town (Alhama de Granada), known since the antiquity. As you see a paradise for mountain and hiking, but also open to other activities. We are forced to comment on a gastronomic discovery. We knew the fame of choto al ajillo (young goat) and region’s wines, but what really gave us ‘vidilla’ (life) in the different routes was the goat’s cheese from Cortijo Arroyo. The owners of the farmhouse surprised us with their sympathy and hospitality, and we understood why the traditional and ecological products taste better. Highly recommended. We took a good sample and thought to ask them more. Qué alegría ver un post de mi tierra, todo el mundo cree que esta zona es árida y sin belleza, y nada más lejos de la realidad, tiene unos rincones increíbles y me alegra ver que otros los están descubriendo. Muy bueno el blog. Me parece una zona espectacular , me encantaría visitarla.